← RVSue and her canine crew have moved! Oh what a lot of catching up I have to do! The crew and I make one more exploratory hike around Camp Primrose in the San Rafael Reef. 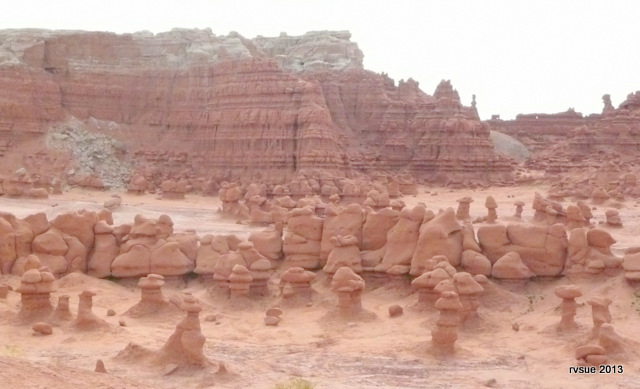 Then off we go to Goblin Valley State Park! It’s only about ten miles away. Admission to see and walk among the goblins is $7 for the day. I park the PTV, get out, open the side door, and the crew explodes out onto the pavement. Gee, guys, calm down. Unlike me, Bridget and Spike are energized by crowds. 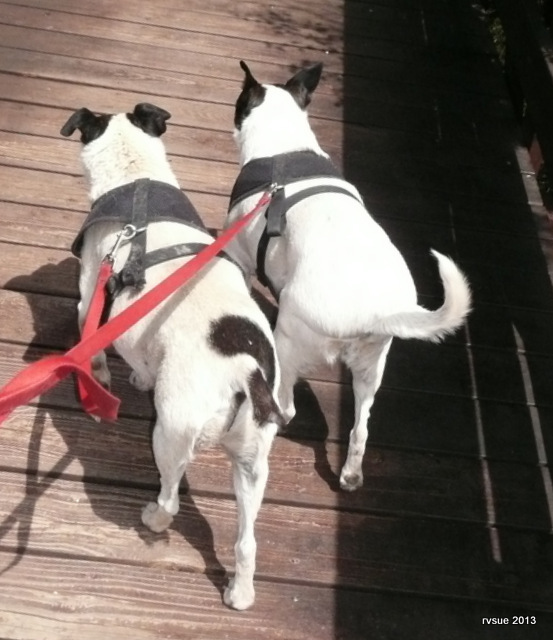 With much skipping, yipping, and pulling on the leash, the crew maneuvers me across the parking lot to the viewing area. Children bail out of vehicles and run down to the goblins. This little guy finally noticed the goblins and stopped throwing a tantrum in the parking lot. No, no, thank you. I watch the activity among the goblins below. Children run hither and yon as children are wont to do. They climb on the goblins, slide down the goblins, fall off the goblins, play hide and seek around the goblins, and have a grand ol’ time. Parents position kids for photos. A twenty-something guy about six feet tall with a ball cap on his head comes up beside me and gets his first glimpse of the goblins huddled below. “Awesome!” he exclaims. Oh, really. Oh boy, have I got a case of Internet Spoiler Syndrome. ISS is when you go to an interesting place and no matter how hard you try, you can’t ramp up any interest of your own because you’ve already experienced the place in the virtual world. Yep, that’s what’s going on here. I already know what it looks like to walk among the goblins, so why bother. I watch for a few more minutes, take photos, and let the crew nose around among our fellow tourists. Yep, them there are goblins. I wonder what goes on in the head of my co-pilot. So. What the heck happened with my blog? Well, it goes like this. I sort of entered blogging through the back door. I stumbled upon WordPress, played with it, and before I knew it, I was signed up with the free platform and blogging my fool head off. Time goes by, the crew and I hit the road, the blog grows. I want some more features, so I upgrade the blog to pay-for-it WordPress. The blog keeps growing. I find myself spending a lot of time at the laptop. Hey, I should get paid for this. So I apply to become an Amazon Associate. Fast forward. Blog readers respond with great enthusiasm as well as with their credit cards. Money starts to roll in from Amazon. I’m one happy little blogger. A fellow blogger tells me I ought to self-host my blog. Yeah, good idea. I should do that. But instead of doing that, I procrastinate which is my go-to modus operandi. Why do today what you can put off until tomorrow? Apparently WordPress has dealt with plenty of procrastinators. The crew enjoys a vacation from the blog. WordPress knows you can’t deal with them (the procrastinator people). Reminders, nagging, threats — None of that works. What does work is lowering the boom. And that’s how it came about that my blog was frozen solid like a hamburger patty left too long in the bottom of the freezer. WordPress’s terms of service do not allow ads (other than their own ad program). The blog must be self-hosted to have Amazon links. Immediately I swing into action! I sign up with Hostgator and try to transfer the blog. It doesn’t work. I have to turn it over to Hostgator’s “migration team.” They dust off the freezer burn and do whatever it is tech people do, and here we are! As I type this, the slideshows are not appearing and the widgets for photos of our faces in the right-hand column are missing. I sent a help ticket to Hostgator. The “live chat” guy tells me everything should be fixed soon. Damn, I missed you guys. It’s great to be back! Note: Thank you for your wonderful messages of support this past week. I still find it hard to believe so many people care about what’s happening with RVSue, Bridget, and Spike. Tomorrow’s blog will cover a lot of ground as I try to get us all together in real time. There’s so much to tell! THIS LINK TAKES YOU TO AMAZON NOW! 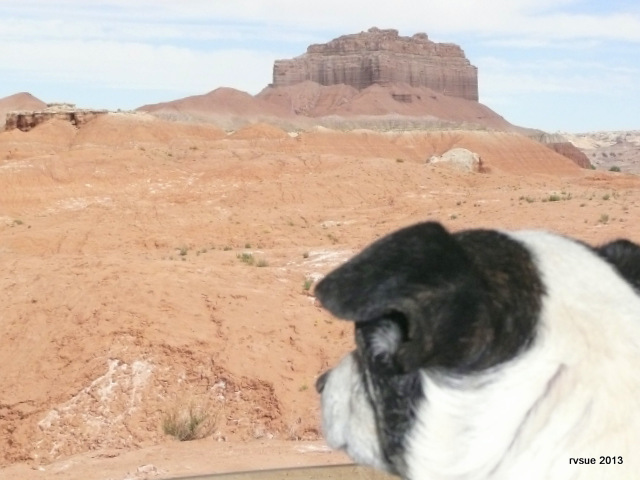 This entry was posted in Uncategorized and tagged blogging, Goblin Valley, rat terriers, RVing, San Rafael, Travel, Utah. Bookmark the permalink. Whew! Glad you are back! Yeah! RV Sue and the Crew are back!! Soooo very happy to see you back in blogging land! Welcome back, dear lady! YAY!! Still a little frozen around the edges, but you’re back! Sorry, Sue, but we that can’t go full-timing yet live through you, so we have withdrawals. And I can see me getting ho-hum about seeing in person the things I might research beforehand. Hi Ladybug! Oh, no, I’m the problem. Usually when I find myself in a fix it’s because I’ve procrastinated. You sound like me, and at 70 years young I am not getting any better at getting things done, ha, ha. Missed you all!!! The picture of your co-pilot lost in his thoughts is fantastic. I missed you, too, Marcia! Spike likes to get in the passenger seat and look out the window or the windshield when we first hit the road. Soon he falls asleep. I’ve missed you! I’m glad you’re back. Your tales make me smile, especially on days when a smile is hard to come by. Thanks for allowing us into your life in such a delightful way, Sue. You’re welcome, Laura. I hope you have many days where smiles come easily. So glad your back! Have truly missed tagging alone. And it’s so nice to hear from you, Michelle. I’ve missed my tag-alongs! Happy Days are here again, I’ve missed you guys Oh So Much…. Thank you for your sweet message, Barbara. Missed you, too! So glad you are back blogging. A day without RVSue and crew is like a day without sunshine. Oh Pauline… You got a laugh out of me with that line! Well look who’s back ! Hope your having a blast between bouts with information technology snaffus. It’s been quite a mess, Mark! But I’m finally coming up for air. I hope my all my readers will find us here. I loved, loved, loved the goblins! Haven’t ever seen anything like them. They must be great in person. And it goes without saying I am even MORE thrilled that you and the crew are back! Sorry I was such a goblin about the goblins. I guess I loved our camp in the San Rafael Reef so much that I wasn’t ready for the goblins who live down the road from there. Thanks for the kind words, Susan. So good to hear from you and the crew again!! Glad you are getting things straightened out. Love the goblins! A stay there just wasn’t in the cards this time. We finished our visit to Bluff. Never did get to the Bluff City Cafe. Instead we had a recommendation for the Cottonwood Steakhouse. So we ate there our last night. Very good but pricey. I did get blue corn meal today, so I can make blue pancakes. Can’t wait!! Looking forward to more stories tomorrow so we can catch up!! I’ve enjoyed reading your blog and seeing the photos of Bluff. You really explored the area, master hikers that you are! The crew and I aren’t nearly as adventurous as you two! I’m glad you had a good time. Chuck and Geri warned me about Cottonwood Steakhouse being pricey, although they agree the food is good. 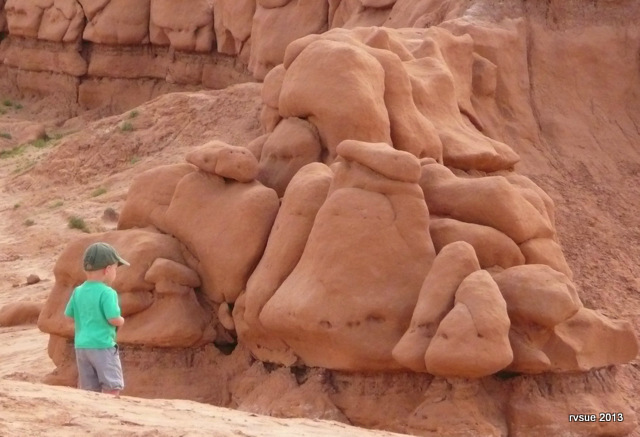 I bet I wouldn’t have enjoyed camping in Goblin Valley State Park with all the families that were there. I’ve spoiled myself with camping so much by myself. WOW! All that internet gibberish was to technical for me to understand. Self hosting? Ad program? Me who still has a flip phone and wouldn’t know how to text someone to save my life. Hash tag?? I know what a skin tag is! Whatever works! Bottom line is I’m glad you are up and running. Missed you and the crew. I missed you, too. I think of you every time I make a salad. One of these days I’m going to do a pictorial essay on my green salad bags. Gosh, the greens are very crunchy! I know what you mean about internet gibberish. It’s a hoot trying to communicate with these tech guys. They’re very patient attempting to decipher what the heck I’m saying with my made-up technological terms. When the green bags effectiveness diminishes let me know and I’ll send you more. Just got a new batch when I was out in Caleefornia. Can’t I buy them somewhere? It’s time I start acting like a big girl and get my own. It’s called giving forward. A friend in Calee buys them at QVC by the truckload….she gave me two packages…..I can share. Most ACE hardwares carry them..but I don’t think you need a whole box. Up to you…………the offer is always there. It’s strange that the bags aren’t sold in smaller quantities. You are so generous to offer me more. I’m still using the first one. I’ve seen them for sale in those places where they have “as seen on TV” stuff… and in catalogs. Glad your back. Guess you’ve heard Tioga George quit blogging. Yes, I did hear about George. In fact, I wrote a snarly comment over there because some people were rude to him. George has been my idol for so long! Without George’s blog I wouldn’t be here. LOL, I saw your comment on George’s site. You said what I wanted to. I don’t blame him for retiring from blogging if I had people like that commenting on my site. I’m glad you spoke up. Of course, I regretted writing it immediately after I hit the button and it appeared. Your comment makes me feel better for letting my emotions rule! It’s just that George has meant the world to me for so long. I was glad to see what you wrote on George’s blog. He’s had a couple of snarky commentors lately, and I hate the things they write. I do hope that George will check in once in a while, he seems like a nice guy. It’s great to be back, Cheryl. I missed you. WOW! The goblins are anything but ‘ho hum!’ Amazing! Of course your blog restarted with a big bang of fantastic photos including ‘the thinker’ Spike. It was worth the wait. So excited and can’t wait to hear what you all have been up too the past week. We missed you soooo much. The goblins are amazing, I agree. I wasn’t in touch with my inner child that day! Love you enthusiastic comment, Rita. Nice to hear from you, as always. Glad your back, I have missed keeping up with what you and the crew have been up to. Hi, Debra! These past few days while the crew and I were seeing something new or I was taking a photo, I had to keep it all to myself! It’s good to be back. I am so glad you are back.. I was worried something happened to you. I just checked the comment section of your last post yesterday and discovered what was going on. I love reading your blog and hearing about your adventures. Welcome back!!!! Thank you, Linda. I wanted to post an explanation on the old WordPress blog but I also didn’t want to push my luck with WordPress. I appreciate your friendly comment. Welcome back. We missed ya!! Thanks, Jerry! Great to hear from you! Yeah!!! so glad you got most of the bugs out and are back to blogging. You are really missed. I love the pictures, as usual. I think those goblins are pretty fascinating. I missed you, too. Yes, the goblins are unlike anything I’ve ever seen. Maybe I shouldn’t have written about my cavalier attitude that day. 🙂 I’m fortunate to be able to visit such interesting places. My day is complete now, I got to read your blog 🙂 So glad you’re back up & running, sure did miss you and the crew. so glad you’re back, sue! we were getting punchy~i don’t think you need to worry about people finding your new site! do we need to re~register? I don’t know about re-register. You’re here commenting, so I guess not. You might want to make a new bookmark though. Sorry I left so abruptly, but WordPress was in control! Goblin State Park to the list…..thanks for everything. You’re welcome, Val! I’ll have to look up Taylor Coach and see what it looks like. Glad you got the money from your Aliner. Sounds like you’re moving toward your goal. Good for you! Glad you are back. I bet Bridget and Spike are giving you what for. Type away I’m missing all the adventures of the three of you. Hi, TexasTom! Bridget and Spike have been the recipients of a lot of attention these past few days. Bridget is lying next to me as I type this. A few minutes ago she started a very soft whine, so I had to stop and give her some lovin’. She probably hates that my face is back in the laptop so much. I hope I don’t need to sign up again (or whatever it was I did) to get the e-mail notifications when you have a new post. Regardless, glad to see you back in the blogosphere. Walt, thanks so much for mentioning the email notifications! That’s another thing missing that I didn’t notice. I’ll see if I can get that feature back on. It will be a while before everything is back how I want it. Even the color of the background is off. Looks kind of pukey on my monitor! It’s great to see you back online…we all worried for a while. Regular email notification came thru within a few minutes of your entry so it apears to work. In less than three weeks I’m heading to Texas to pick up my new “Juanita” Casita. So excited!!! Jeannie! Less than three weeks to go! How exciting for you! You will love your Juanita. I haven’t regretted choosing the BLT for one second. It’s a great little home. I appreciate you letting me know the email notifications are coming through. I do need to figure out how to have that option available to new readers though. Gee, you’re picking up your Casita at a great time of year, what with the summer ahead of you. The crew and I picked up the BLT in mid-August when Texas temps were, oh, about 189 degrees in the bloody shade! And all this time I thought it was because I made the comment, “Where the “H” did that guy come from!” …..glad to have you back. We have been busy on our end here….traveled to Little Rock to pick up our fixed 1998 diesel pusher, went to Camping World in Bartow, Florida yesterday and purchased a 2008 Jayco Melbourne 31B which we pick up on Friday. Should be back on the road after a week-long shake down! Wow! Exciting times for Dave, Marcia, Bubba and Skruffy! Congratulations! Good luck with the shakedown cruise. Ha! You thought I was censored . . . Well, I guess in a way I was. Welcome home….. to our home I mean! Feels like you have been gone so long! When Chuck and I were at the Goblin campground, it was only about half full, probably because it was 100+ degrees while we were there! But we enjoyed our stay! That was the first test of our newly installed swamp cooler in the MotherShip! It worked great! Now…. where the heck are ya? Give me another day . . . so I can bring everyone to our new camp in a blog post with photos! So good to have you back and look forward to when the techs get you all set up again. Thank you, Alice and Rudy. I’ll be glad when all this tech stuff settles down. So glad you are back. Tioga George leaving and you off line all in the same day was too much for this wanna-be full timer! I thought the same thing, Rose. I couldn’t blog and I couldn’t read George! I remember what it’s like to be a “wanna-be full timer.” Blogs kept me from losing hope. I’m still a wanna-be full-timer. Unfortunately, my job is being eliminated in a couple of months and I’m neither old enough to retire or young enough to say what the hell and just go. That plus having a special needs child to help care for means the dream will be delayed – but not given up! I REALLY MISSED YOU!! I just asked this morning over on Google + if anyone had heard from you recently. Then I saw on Al from the Bayfield Bunch blog that you were almost back and sure enough here you are. Looking forward to your catch up stories tomorrow. Agaiin Welcome back! Thank you, Betty. I appreciate your loyalty to my blog. I need to write a thank you note to Al thanking him properly for letting me use his blog. It’s a big help in letting folks know the crew and I are back. SOOOO!! glad you are back. You are my inspiration for solo traveling. At first I thought something seriously had happened to you. Then found out about the technical problems you were having and just waited and waited for your return. PLEASE don’t ever leave us. Gee, there was a time in my life I felt everyone would be happy if I just LEFT! Now you ask me not to leave. How sweet! I’m sorry for dropping everyone without warning. I hated that. Oh well, the blog is up and I have lots to write about! Thanks for writing, Karen. Glad you’re back. OK to order yet? Got some Loius LaMour books for you. When you know where you’ll be for a bit, I’ll send them General Del. Oh, that would be great! I want to try that author. Very thoughtful of you, Chuck. My Amazon sales took a dip while the blog was stalled, but I’m happy to see orders again! It is so wonderful that you are back and now I can return to my few minutes of complete relaxation in the evenings. Did you ever think you would be so missed and loved? Teachers are the best!!! I’m far more popular as a blogger than as a teacher! Sooo glad ta have ya back in blogland! Just don’t ask me to write a lesson plan . . .
Sure glad you’re getting this sorted out. I know all about procrastination. Usually revolves around getting posts written, amongst other things. You’ll find there’s many options in WP to add all kinds of widgets and plugins to do what you want. But it takes time. My WordPress administration page is kind of lame. Lots of stuff didn’t transfer over so I can’t do all the things I want. In other words, the capability isn’t there which is frustrating. I’m hoping Hostgator will fix that for me soon. I did enjoy the goblins. It was enough to watch other people run around in them. Love the comment about ISS. I, too, have experienced that in some of my travels, especially where crowds of humans are involved. But rather than let ISS be an affliction, I think that it frees us to experience the beauty and loveliness in the less-photographed world. Good point, Eileen. I’ve taken a break the past few days from the big tourist spots. I’d rather photograph everyday things. Nice to hear from you! 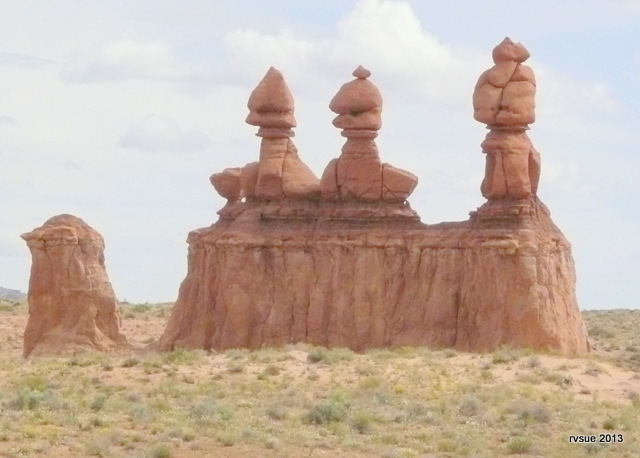 When we saw Goblin Valley it was going to be a quick side trip because the sign got us curious on our way to other Utah destinations. No preview for us. When we arrived we found our inter-child and explored most of a October weekday day with few other people there. We ended up boondocking nearby. Often the best thing about travel is what you find if you are willing to go where the road takes you. I am so glad you are back. Right now our travels are limited to vacations with 5 more years of work in our future. Your blog allows me to enjoy the journey when I get home from work. Missed you Sue! 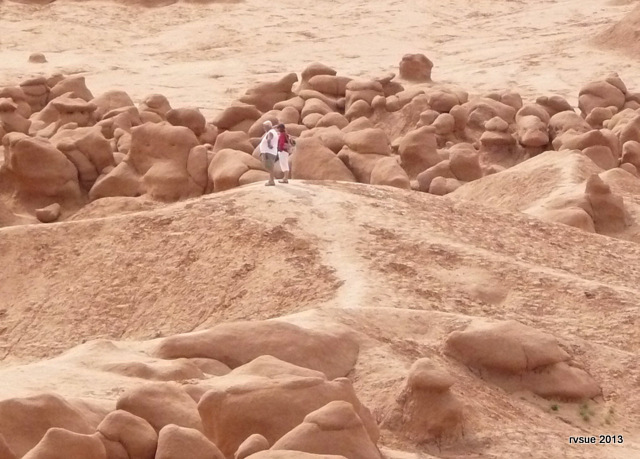 Your day at Goblin Valley sounds wonderful. I love it when a “quick side trip” turns into something special. That’s the way it is when I drive down a BLM or Forest Service road looking for a place to camp and find a lovely setting for our home. It’s happened many times already and I count it one of the greatest joys of boondocking. You probably have experienced the same. I missed you, too. Five more years. It’s great that you know what you want to do in retirement. Too many people don’t have a vision and that’s sad. Thank goodness and Hurrah!. You know, your blog has grown to be a part of our lives here in toasty Alabama. Partly envy, partly because you love your hairy partners just as we love our own mutts, partly because we just love what you’re doing, whatever, we like reading about your travels and travails. So keep it up. Thanks for reading my blog and telling me you enjoy it. I hope I have more travels than travails coming up! Posted your new addy on the two Casita sites. Thanks for doing that for me, Ron. I appreciate the help, believe me. My tech-to-do list keeps growing! YOU’RE BACK!!!! I MISSED YOU! And Spike and Bridget, too! Folks – remember to use Sue’s links to Amazon. It can be a way to say THANKS for all of Sue’s effort and for sharing her life with all of us. Just wanted to add that my husband and I are soooo glad that you are back! It has been so much fun reading about your adventures. We anxiously await each new entry. Thank you so much! You make our day! You’re welcome, Nickie! I’m glad you have some fun reading the adventures of me and my crew. We sure have a great time making them! Nice of you to add your comment . . . So happy to have you back. Missed you, and Spike, and Bridget. Hi Carol… I missed you, too, and I pray you have no more tornadoes out your way! Welcome back Sue! Hope the blog crisis didn’t cut too far into your days of walks and photos and adventures with the crew! Hi Alison! Actually it was like a mini-vacation from blogging for a few days. That is, until I got the go-ahead from Hostgator and had to work on putting it back together again. Fortunately, Hostgator people did and are doing most of the work. Thanks for the welcome. It’s good to be back. I am so glad you’re back! I too am a huge procrastinator so I’ve had similar things happen. I’ve been wanting to go back through your blogs and make notes on your tips and places you’ve seen and I’ve been putting it off. This has lit a fire under me to finally do it! I definitely have the goblins on my list. I can’t wait to be able to see, smell, and touch the places in nature that I have only seen in photos. Actually, this is the first time I’ve seen the Goblins at all and and I have to admit, I caught my breath at the awesomeness of the area. Thank you for sharing! p.s. I’m saying this to be helpful, not to be a noodge. I noticed that the times listed on everyone’s post say tomorrow morning. It’s still the 29th on the east coast. I AM SO GLAD YOU’RE BACK! WHOO HOO! Hey, you’re right! The post’s date and the comments dates are wrong! Something more for my tech-to-do list. I appreciate you letting me know, Donna. You’re very observant. I saw a lot of photos of the goblins over the years that I was a wannabe full timer, so I guess I was jaded. Do make a point of going there and let your inner child play! Welcome back…….hpe we will get the post like we did before. Your comment is my first of this morning. How nice to sit down with my coffee, open up my laptap, and see your welcome back as well as others’. Thank you. The Big Void is gone…glad you’re back Sue. Life with out a daily dose of RV Sue and her K-9 crew is like…well a Big Void that’s all. My hands perch above the key board and I wonder where I use to go before there was RV Sue, then magically my fingers type for the thousandth time and bingo you are back. Hurrah…yip..yip..yip..Yippy! Well, Joe, the Big Void was gone, but now she’s back!!!! Haha! Love your comments. You have the quirkiness factor, just like I do. How wonderful to start my day with a hurrah! Thanks. Hallelujah! So glad things have turned around for the better in your life, Lana. Best wishes to you and your daughter-in-law . . . and your whole family! Aunt Susan I’m glad you are back! I always go to your blog at night so that I can finish the day knowing you are ok. Love you lots! Oh, Tawnya. I wish I could wrap my arms around you and give you a big hug. You are the sweetest, most loving person! I hope everything is good in your life right now. Hi Sue, I’m so glad your back in action and will be blogging your little fingers off to get us caught up. Your return was definately worth waiting for and appreciate the effort you put in to get it back up and running. Okay. This is the “Laurie from Southern Oregon” who is in South Dakota right now and loving it, right? The lady who got some wheels under her and off she went like a bird from a cage! I’m glad to be “back in action.” Thanks for waiting for the crew and me to return. Glad you are back! I have been following your travels for a few months, I really missed your daily blog. I so enjoy your style of blogging. Thanks for sharing your life with us. You’re welcome, Colleen! It’s good to know you like my style of blogging, because it’s the style that’s easiest for me. When I sit down to type up a blog post, I try to write like I would talk if a person were sitting here with me in the BLT. Nice comment. Thanks. Thanks, DesertHawk. Good to be back! Let me join in will all your followers in saying….”So glad you are Back !!! Hi Glenda . . . And I am so glad I didn’t lose you during this Week of the Frozen Blog. I missed you! Well, here you are! I also have the procrastinations about moving to self-hosting. If you aren’t self-hosted, Roxie, I hope my fiasco breaks your procrastinating. I don’t think the blogosphere could stand losing the Duck! Lol! Thank you for being kind. The blogosphere might say what the quack? and then it would move on. No, No, No; all you bloggers mean a lot to those of us that follow along but are too lazy to join the group. We enjoy you all. Our favorites; RV Sue, Good Luck Ducks, Phunnyfarm, the Bayfield Bunch, Glenda. We really enjoy you all. Don’t procrastinate. We don’t want to lose you. Only we are allowed to do that. Hi to you, too! I feel like the crew and I have been away for ages. It’s good to be back. What a nice thing to say, Dave. It’s good to be back. BTW, I like the header on your blog . . . Trains speak to us vagabonds, don’t they . . .
Whew! Glad you’re back. I also worried it was “something I said” that got you booted. If that were the case, I’d be running like “H” because there’d be a whole lotta people mad at me!!! LOL Thanks for giving us non-bloggers a heads up on the twists & turns of blogland. Funny picture… BuckeyePatti running from all my followers! I wish I could have given you a “heads up” BEFORE my blog froze up, but I was as surprised as anyone when it happened. I’m glad you are still with me and the crew. Exciting to see your .net site come up today. I did not know why you went down, then I scanned your last blog. What did not make sense is the fact they froze you when you PAID them??? The .com domain name should have been able to be pointed to the new hosting server if you own the .com. Ugh, why must some make it hard for others. Don’t feel too bad with hang ups. I’ve had to replace 2 front tires… $1300. Still waiting on a couple window locks to arrive from Winnebago. Thursday I will take the RV out to the service center for their finally check. Then I can finish loading/packing it. Hopefully, we will pull out in the next 10 days or so. Or Gary is liable to give up on me and drive himself in his power wheelchair. He’s anxious to get going. Glad you and the crew are back online. Well, I paid for certain features on WordPress. But I also agreed to their rules, which included the rule for no ads other than through their ad program. Somehow my selective memory kicked in and I forgot about that! Sheesh… Expensive tires. I can understand Gary being anxious to get going. This time of year is perfect for RVing and the whole summer stretches ahead of us. Nice to hear from you, Kay. Best of luck with the loading and packing! RvSue, I second Kay’s thought about your main domain (the .com) being able to redirect to wherever you choose. Have you worked with the folks at Go Daddy on that? I would think that you could choose to have both .com and .net resolve to the same server of your choice. Glad you’re back. Glad it wasn’t something more awful that kept you away. Can’t wait to see where you go next! I’ll be glad when this blog is patched up and polished so I can get my focus back on the adventures of the road. I’ve been staying in one place for several days because my trusty antenna can pick up internet signal here. It has been good though to slow down after the many fantastic sights of the past month! Nice to hear from you . ..
Glad to see you’re back, Sue. I just recently started reading your blog (found you over at one of Bob’s blogs) and all of a sudden the posts stopped. I kept checking back, but no Sue. Today, I see you have a .net. Well, that’s weird. What’s up? I thought. Good to see you got it all worked out. There are many bloggers out there on the free platforms (WordPress.com and Blogger) but many of them probably don’t realize that the free platforms own their content. They can shut you down at any time for whatever reason. If you spend 5 years blogging and make one mistake, your site can be gone. It was a great move to go to a self-hosted site, even if it wasn’t necessarily by choice. There may be more technical things to learn but if you can watch a YouTube video, you can learn anything. Good luck with the new site. I’ve enjoyed reading about you and your crew. Hi, Troy, and welcome to the land of rvsue and her canine crew! One of my big concerns during this week my blog was dead was my new readers. I thought, great, somebody comes to my blog a few times and the same old post keeps popping up. Thanks for your comment and for not giving up on us! What more can I add but everyone has said “Welcome Back” in so many ways. Glad you are here. And I’m glad you’re here, Emily (in more ways than one, considering the weather your state has suffered). Sue, you should not be so surprised about how many of us missed you. Your blog is like a continuing serial story or TV drama, except it is real and inspiring. Further, you write with honesty and humor. May I recommend that one day when you are near the eastern edge of Montana, you go to Glendive and then to Makoshika State Park? You can look it up, as the grandeur of being in that huge landscape cannot be captured in photos. LOL If you’ve been there in the past, I’m sorry I missed your blog about it…I’m a relatively new reader. Hello Carla or C.J., whichever you prefer! I will definitely get out my Montana Benchmark atlas and find the state park you mention. I fell in love with Montana last year and I know, God willing, I’ll revisit the state many times. I do hope you’ll go back and read my posts for 2012. It was an incredible year! Thank the stars your back…I’ve been going through severe withdrawls!! I’m trapped in muggy buggy NE GA but when the farm sells I’ll be joining the fulltimers I think. I get cranky if I don’t get my RVSUE fix…please say hey to the dogletts too. The “dogletts” haven’t got up out of bed yet! The mornings are chilly here, but since it warms up around mid-morning, I don’t bother to put on the heater. So the crew likes to stay “under cover” until later in the morning. You should hear Spike grumble if I happen to bump him while he’s counting his zzzzzs! Gee, Mindy, I commiserate with you. Georgia should adopt “muggy buggy” as its byline. You know how New York is the Empire State? How about “Georgia the Muggy Buggy State?” Oh no, now my Georgia readers will be after me . .. The “I think” in your statement about becoming a full-timer has me wondering if you are committed to the lifestyle change. Good luck deciding what is best for you. I hope my blog helps. So glad to see you back Sue! Grant says to tell Spike and Bridget he missed them while they were on vacation from blogging. He is eagerly awaiting a canine corner post. It’s nice to be back, Juley! Yes, I need to get the crew back to work on the Canine Corner. I wish one of them had an IT degree. Thanks for commenting, even after so many ahead of you. It’s reassuring to know I haven’t lost you! Ha! Just try and lose us. It will be like losing a group of stalkers. Oh Sue welcome back! I have REALLY missed you and Spike and Bridget all week! So glad things are working out. Sincerely a fellow procrastinator. Why do we procrastinate so? When I was a teacher I couldn’t procrastinate about anything as the gears of the school year keep turning no matter what and there’s no stopping them. But in my personal life? Oh boy. One of these years I’m going to do my taxes before April rolls around. Thanks for the welcome. I missed you, too! As for Spike and Bridget, they’re clueless. With them it’s all about food, sleep, walks, and adventures! Hi Jenny! I realize you and most of my readers enjoy the antics of Bridget and Spike, and I’m happy to share them with you, but, remember, I have to live with them! Sometimes they drive me batty. Bridget is little Miss Passive-Aggressive and Spike is, well . . . SPIKE! Thank you for your loyalty to my blog. I missed you, too, Linda. I appreciate you dropping in with a comment. Looking forward to seeing what RV Sue & Crew has in store for us. Great timing, Ms. M! We are in sync! I’ve been saying “What the heck!” a lot lately, trying to get back into blogging again. All these warm welcomes make it worthwhile, including yours. Thanks for writing. Hurrah! You’re back! I was so hoping that your absence was from technical problems instead of something really scary! Good thing I was able to post messages in the comments section. Thanks for dropping in, Louise. Glad to have you back Sue! You are a wonderful resource for those of us on the road (and those that want to be). Your blog is so well written, and I missed not seeing the posts popping up in my Reader. Glad you were able to get it all worked out. It’s fantastic to be able to look at the future as if it’s a huge platter of delicacies . . . Hmmm . . . What shall I do next? Where shall I go? Shall I have another one of these, or should I try something new? LOVE IT! SO GLAD you guys are back – yay! What would we do without our daily dose of Sue and the Crew? I look forward to hearing your adventures for much time to come. The goblins are quite a sight. It must be a fun vacation for children whose parents take them camping at the state park campground and then let them play among the goblins all day with a picnic under the shelter. It was fun watching the families having fun (in spite of the tantrum-throwing kid!). Thanks for adding your kind words, Marcia. Glad you are back.Have really missed you and the crew. Soooo glad to have you back, Sue. I missed ya somethin awful! Love the pic of your copilot, but tell him to move over and make room for me! Hi Cherie . . . For the time being, you can get inside Spikey’s head and see the world through his eyes on this blog. Thanks for the sweet comment. Thanks, Wayne. I’m glad to see you’re still with me and the crew. Great suggestion, Jim. I usually do mention the location at the beginning of each post or somewhere in the first or second paragraph. Another thing you can do is look at the sidebar for Where We Are Now. I try to keep that up-to-date. I’m so glad you found my blog. I hope you will stay with me and the crew and this wonderful community of readers who have adventure in their hearts and gypsy in their souls! I too am overcome with ISS when I go to those places that are on everyone’s ‘bucket list’. That is one of reasons that I avoid them as much as you do. Another reason, as you also well know, is most of the ‘bucket list’ places are not dog friendly. You did take a great picture captioned “Security goblins” that I don’t remember seeing before. I would prefer to call those chess pieces rather than goblins however. Yes! Perfect! Those goblins do look like chess pieces. I should’ve made the connection immediately, as a former member of a competing chess club, but that was many years ago. It’s good to hear from someone who also experiences Internet Spoiler Syndrome also known as Interesting Stuff Saturation. A person can only absorb so much spectacle! Glad to have you back in cyber space. I missed your posts. I hope things clear up with the new blog. Nothing like being pushed to get you out of procrastination mode. Boy, do I need a good push once in a while. I put off doing the dishes, for instance, just throwing them into a dishpan. Then when I can’t find anything off of which I might eat a meal in a civilized manner, I get around to washing them. I use the excuse that this method conserves water. Sure. I missed you, too, Diane. Thanks for the comment. Glad you are back! Missed you. By the way, we have a good connection again. On to La Pine State Park for several months. Take care and keep posting. So glad to see you all are back up and going. Your absence sure left a void in my day. It’s just like seeing a dear friend again. “It’s just like seeing a dear friend again.” What a tender sentiment. Thank you, Don. It’s amazing that the internet can bring me and the crew into people’s daily lives in such a personal way. It’s hard for me to fathom sometimes. Best wishes to you, your family, and all the folks in Oklahoma. And has fate with have it you return the day TIOGA GEORGE Posts his last blog..
May you also rein for many years… ps thanks for really making me feel good..
You’re welcome, John! It makes me proud to think my blog can brighten someone’s day. Oh, I don’t want to be the Queen of Blogs… What I really want is for the King of Blogs (Tioga George) to be posting again. But the grown-up part of me realizes the man deserves some rest. He’s made quite a positive contribution to the world. Hi, Dixie! Good to see you here! No, my techno problems are not solved . . . yet. My biggest heartache of the entire ordeal was the loss of my slideshows. I still have the photos, but the slideshows are kaput. I’m going to go back and try to reconstruct them individually which will probably take about an hour for each one, if I can do it at all. Best wishes to you, too, for a carefree and enjoyable summer! What a Memorial Day vacation! You can’t have another one until Labor Day weekend. Missed you, too! You provided so many of us a lesson in the blog world. Who knew? I think Memorial Day Weekend delayed my comeback. I missed you, too! Yes, there’s a lot to learn about the world of blogging. I’m walking a similar tightrope with Amazon. One wrong move and it’s gone! I don’t know if what I’m going to suggest will be any quicker but I would think so. 1) You need to be able to open your old blog, be able to go to the archives and open the posting that has a slide show. I assume that you can. I have used your posting of April 18, 2013 in this example. 3) Compare the code that you see in your old posting to what is shown in your new page for that same date. I assume that you will find that the slideshow coding is missing. 4) This is the part that I do NOT KNOW if you can do or not but will be easier than re-building the slide show from scratch. Copy ALL of the missing slideshow code from the old page and Paste to the new page for that same date in the space where it is missing. Donna & I along with Dakota, Isabelle & Pippy are glad you’re back. Every post is a lesson learned. Keep it coming’. I’ll try, Allen! Thanks to you and Donna for reading my blog. Yippee! So glad and relieved to see you back. Was really getting worried! Love reading your posts! Safe travels to you and the crew!! I’ve missed you! We live vicariously through you, ya know 🙂 The comments in my camping Facebook pages were all the same: What happened? We hope she’s back soon! We’re also several volunteers along with beginning a whole new system in the online community. Your website presented us together with precious information and facts to help art with. You have completed a remarkable task as well as our own overall location shall be relieved to your account. Nice post. I’m verifying frequently the following website using this program . astounded! Very beneficial facts particularly a ending section 🙂 My spouse and i care for such information a lot. I’d been looking for this specific info for a long period. Many thanks and greatest of chance.